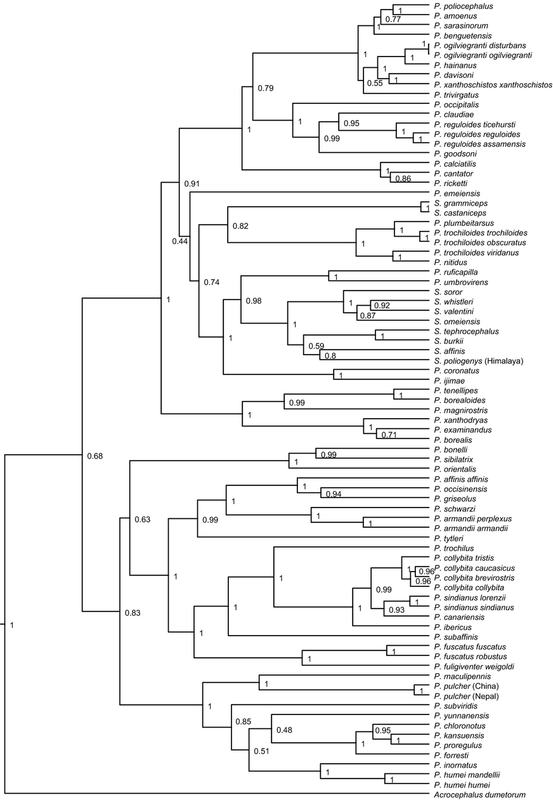 Keywords: Model of evolution, Phylloscopus, phylogenetic signal, Seicercus, song evolution. Songs in passerine birds are important for territory defense and mating. Speciation rates in oscine passerines are so high, due to cultural evolution, that this bird lineage makes up half of the extant bird species. Leaf warblers are a speciose Old-World passerine family of limited morphological differentiation, so that songs are even more important for species delimitation. We took 16 sonographic traits from song recordings of 80 leaf warbler taxa and correlated them with 15 potentially explanatory variables, pairwise, and in linear models. Based on a well-resolved molecular phylogeny of the same taxa, all pairwise correlations were corrected for relatedness with phylogenetically independent contrasts and phylogenetic generalized linear models were used. We found a phylogenetic signal for most song traits, but a strong one only for the duration of the longest and of the shortest element, which are presumably inherited instead of learned. Body size of a leaf warbler species is a constraint on song frequencies independent of phylogeny. At least in this study, habitat density had only marginal impact on song features, which even disappeared through phylogenetic correction. Maybe most leaf warblers avoid the deterioration through sound propagation in dense vegetation by singing from exposed perches. Latitudinal (and longitudinal) extension of the breeding ranges was correlated with most song features, especially verse duration (longer polewards and westwards) and complexity (lower polewards). Climate niche or expansion history might explain these correlations. The number of different element types per verse decreases with elevation, possibly due to fewer resources and congeneric species at higher elevations. Song characters show significant phylogenetic signals, but are considerably more labile than morphological characters (Blomberg et al. 2003) and frequency song parameters are more conserved than temporal and structural ones (Mahler and Gil 2009). Body size is negatively correlated with frequency characteristics (Wallschläger 1980; Badyaev and Leaf 1997; Mahler and Gil 2009). Song characters (particularly frequency parameters) are strongly influenced by habitat characteristics (Badyaev and Leaf 1997; Rheindt et al. 2004). Song parameters vary significantly with geographic distribution, that is, with latitudinal and longitudinal extent of breeding areas (Mahler and Gil 2009) and with elevational preferences in the breeding season (Snell-Rood and Badyaev 2008). Figure 1 Distribution map. Breeding distribution of leaf warbler (Phylloscopidae) species according to BirdLife International & NatureServe; species richness increases from dark blue via green and yellow to red. Sonogram plate. 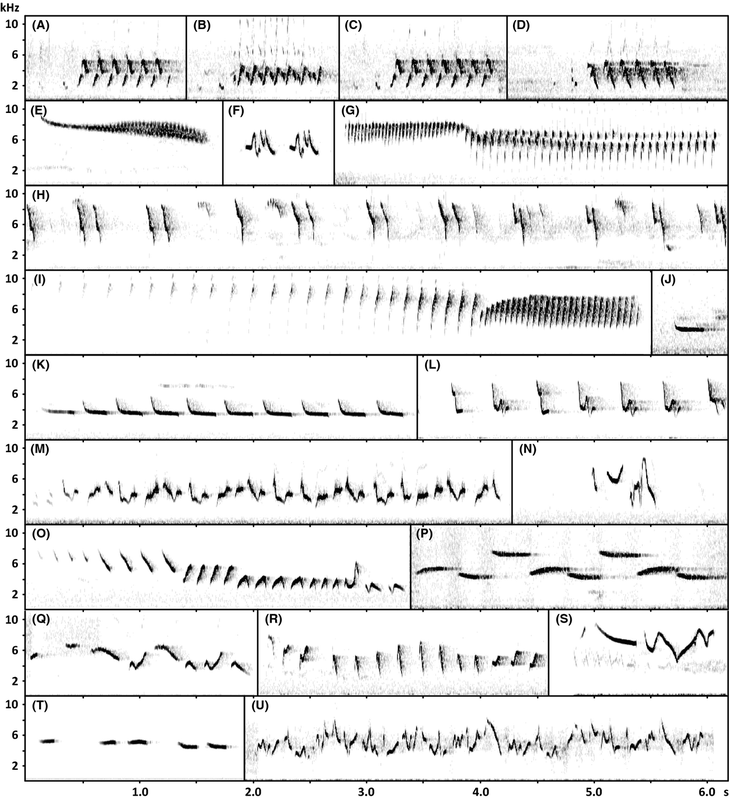 Selection of sonograms highlighting variation and composition of leaf-warbler songs. Phylloscopus schwarzi a–d: four strophes of the same individual (pauses omitted) representing three different song types (Russia, Ussuri 1990, J. Martens); P. humei mandellii e: buzzing song pattern (China, Shaanxi 1997, J. Martens), f: call-like song pattern (China, Shaanxi 1997, J. Martens); P. forresti g: reeling song pattern (China, Gansu 2010, J. Martens); h: part of endless song pattern (China, Sichuan 2000, J. Martens); P. sibilatrix i: reeling song pattern (Germany, Saxony 2011, B. Fischer), j: call (Germany, Hesse 2011, B. Fischer), k: call-like song pattern (Germany, Saxony 2011, B. Fischer); P. collybita collybita l: (Germany, Saxony 2011, B. Fischer); P. collybita tristis m: (Russia, Novosibirsk 1986, J. Martens); P. tytleri n: (India, Kashmir 1976, J. Martens); P. trochilus o: (Germany, Hesse 2011, B. Fischer); P. borealoides p: (Japan, Hokkaido 1996, M. Päckert); P. calciatilis q: (Laos 2010, J. Martens); P. umbrovirens r: (Ethiopia, Oromia, B. Fischer); P. inornatus s: (Russia, Komi Republic 2006, A. Lindholm); P. magnirostris t: (China, Shaanxi 1997, J. Martens); P. plumbeitarsus u: (Russia, Ussuri 1996, M. Päckert). Phylogeny of leaf-warblers (Phylloscopidae). Molecular phylogeny of leaf-warblers (Phylloscopidae) based on a 1900-bp alignment of three genes reconstructed in BEAST (genes and codon positions partitioned, GTR + Γ + I model for cytochrome b and myoglobin, GTR + I model for 12S rDNA, 30 million generations). Bivariate correlations. Selection of bivariate plots between explanatory and response variables: (A) duration of verse on distance from the equator, (B) song speed on body mass, (C) number of elements per verse on range extension to the East, (D) mean frequency on body length, (E) maximum element bandwidth on range extension to the South, (F) complexity1 on range extension to the North, (G) complexity2 on distance from the equator, (H) principal component 2 from the PC analysis of structural song traits on distance from the equator, (I) principal component 1 from the PC analysis of frequency parameters on range extension to the South. Regression lines were omitted, if direct correlations were insignificant. The hypothesis that song characters show significant phylogenetic signals could be confirmed in general, although a few song parameters such as element diversity slightly and frequency bandwidth and frequency gradient clearly missed a significant deviation from random distribution across the phylogenetic tree. The hypothesis that body size is negatively correlated with frequency characteristics could be confirmed. Nevertheless, not all such correlations were supported by phylogenetically independent contrasts. Body length significantly contributed to linear models explaining variation of maximum, minimum, and mean frequencies. At least one body measure significantly contributed to the corresponding pGLS. While neither of the two was the best predictor for the extreme frequencies, body length was for mean frequency. Contrary to the results by Mahler and Gil (2009), the hypothesis that song characters (particularly frequency parameters) vary strongly with habitat characteristics had to be rejected for leaf warblers. We are well aware of singular adaptations to habitat such as P. magnirostris to mountain torrents (Martens and Geduldig 1988), but we here only considered vegetation density. The direct correlation of this habitat dimension with frequency bandwidth was highly significant, but due to phylogenetic relationships among the taxa. In fact, there is mixed evidence of habitat affecting vocal traits from previous studies. Mahler and Gil (2009) tested this hypothesis only indirectly using tarsus/beak ratio as an indicator of habitat use and found no effect after analysis of contrasts. In an earlier study, Badyaev and Leaf (1997) found for Phylloscopus and Hippolais warblers that temporal parameters are strongly correlated with habitat structure while frequency parameters are not. Rheindt et al. (2004; p. 385) confirmed an effect of habitat on frequency song parameters only if both traits were phylogenetically corrected (but after complex correction for autocorrelation the habitat effect was not detectable anymore!). The hypothesis that song parameters vary significantly with geographic distribution (latitudinal and longitudinal extent of breeding areas) could be confirmed. Distributional traits were the strongest contribution to linear models, explaining 8 of the 13 direct and 8 of the 9 derived song traits. Basic components of leaf warbler song evolve under a Brownian motion model, being possibly innate. Although body size is also phylogenetically constrained, it is strongly correlated with frequency even after phylogenetic correction. This indicates a causal correlation for physical reasons reported earlier. The habitat variable might still be too simplified, because it merely reflects increasing habitat density. The impact of habitat on leaf warbler song appears to be more complicated than could be tested in this approach. Habitat and geographical dimensions should be replaced by environmental-niche components in order to work out ecological–physiological causalities. This should be further combined with historical biogeography in order to trace song trait evolution more realistically. Badyaev, A. V., and E. S. Leaf. 1997. Habitat associations of song characteristics in Phylloscopus and Hippolais warblers. Auk 114:40–46. BirdLife International & NatureServe. 2011. 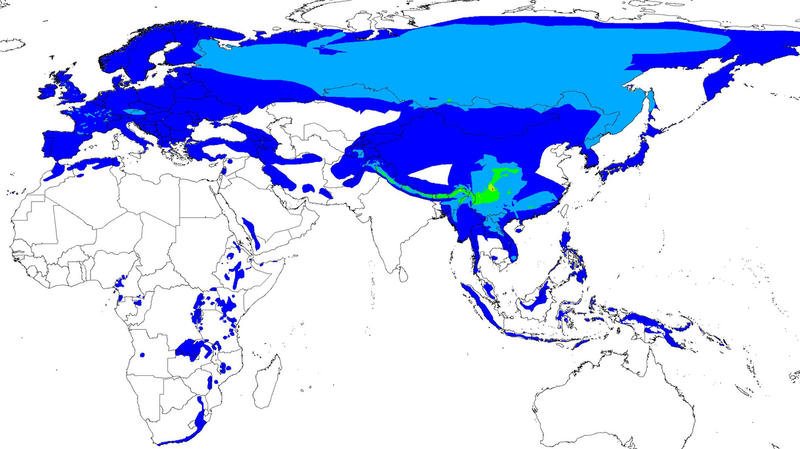 Bird species distribution maps of the world. BirdLife International and NatureServe, Cambridge. Mahler, B., and D. Gil. 2009. The evolution of song in the Phylloscopus leaf warblers (Aves: Sylviidae): a tale of sexual selection, habitat adaptation, and morphological constraints. Adv. Study Behav. 40:35–66. Martens, J., and G. Geduldig. 1988. Acoustic adaptations of birds living close to Himalayan torrents. pp. 123–131 in van den Elzen R., ed. Current topics in avian biology. Proceedings of the international centennial meeting of the Deutsche Ornithologen-Gesellschaft. Verl. d. Deutschen Ornithologen-Ges., Bonn. Rheindt, F. E., T. U. Grafe, and E. Abouheif. 2004. Rapidly evolving traits and the comparative method: how important is testing for phylogenetic signal? Evol. Ecol. Res. 6:377–396. Snell-Rood, E. C., and A. V. Badyaev. 2008. Ecological gradient of sexual selection: elevation and song elaboration in finches. Oecologia 157:545–551. Wallschläger, D. 1980. 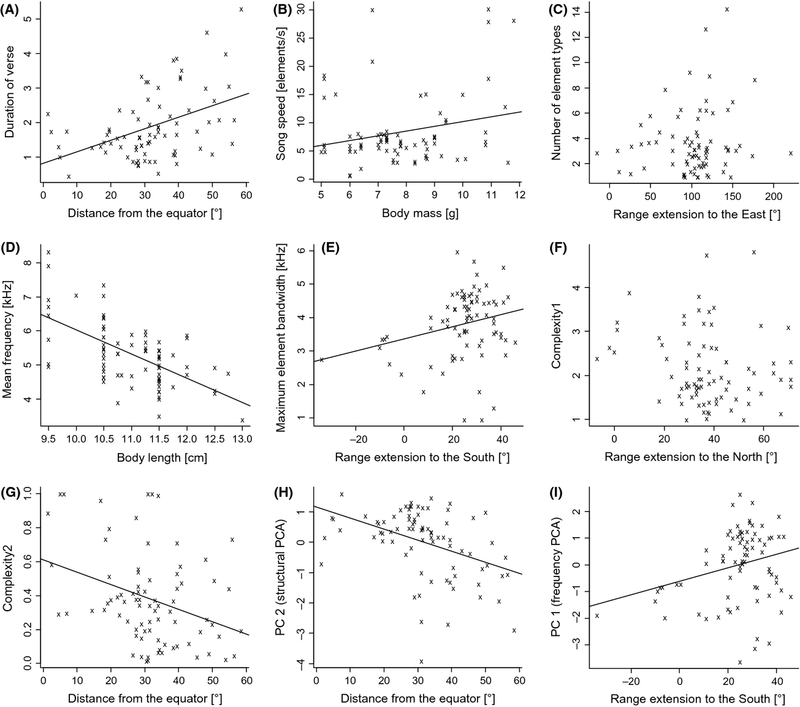 Correlation of song frequency and body weight in passerine birds. Experientia 36:412.